How Do I Know My Scale is Accurate? Accuracy is the most important quality for scales and so there are methods for testing and calibrating weighing equipment. 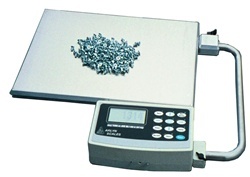 The accuracy requirements for scales can vary widely depending on their purpose. For example, scales use to weigh livestock and large equipment generally has lower accuracy requirements. In comparison, scientific scales used in research laboratories typically require exceptionally high resolution and precision. Our ultra precision equipment utilizes surface acoustic wave (SAW) technology to provide accuracy and resolution in the 1:100,000 to 1:200,000 range. When considering scales, three main qualities determine whether they are working properly, the first of which is resolution. Resolution is the value that tells the user how close the scale can read to the object’s true weight. For example, a scale may have a resolution of one gram. What this means is that if an object weighs 20 grams, then the scale will give a reading for the object up to one gram either way from the object’s true weight. Precision differs from accuracy because accuracy is needed once, precision is need all of the time. If you weigh the same object repeatedly, but get different measurements each time, then the scale has low precision. On the other hand, if you get the same reading every time you weigh the object, then you have perfect precision. However, precision does not equate to accuracy. For example, if the resolution of the scale is low, even with perfect precision, it will not give you the true weight of an object. In order to have high accuracy, the scale must have both high resolution and high precision. Over time, scales can lose accuracy due to plain old wear and tear due to regular use and age. Scales must maintain their original balance for accuracy, but over time they tend to lose this balance and they will require recalibration. Electronic scales may suffer malfunction in the circuitry over time that can cause loss of accuracy. Even new scales may become inaccurate in certain conditions especially in extreme temperatures. For this reason, the most accurate scales will have high temperature stability. Additionally, new scales may lose accuracy in rough conditions especially when equipment is subject to vibration and jarring. In outdoor, industrial and similar environments, it is necessary to clean weighing equipment to maintain accuracy especially for high precision work. For scales that don’t require high precision, it is possible to use objects with known weights like dumbbells to test the scales. Although the weight of a dumbbell is not that accurate, it will suffice for these purposes. The scale must be on a flat and level surface for testing. Start by setting the scale so that it reads zero. For manual scales, you may need to turn a wheel or screw that adjusts the reading. Once the equipment reads zero, place the object with known weight on the scale. If the reading is not accurate, adjust the scale to get the correct weight of the object. Digital scales may have calibration options that allow adjusting of the reading. If the scale does not provide any option for calibration, then you can still use the scale, but you will have to compensate by correcting measured weights using the error factor. In order to test the precision of the scale, it is necessary to repeat the test several times to see whether the result is the same or nearly the same. If the readings are widely different, then the scale has low precision. Scales used in scientific, engineering, manufacturing and similar types of operations often require extremely high accuracy. For such testing, it is necessary to use certified calibration weights instead of more common objects like dumbbells. A good method is to use three weights with a ratio of about 1:2:4 and with a sum that represents a substantial percentage of the scale’s capacity. Start off by zeroing the equipment as in the process mentioned above. Then begin measuring weights to see whether they produce the same results consistently, as this will test for precision. To test accuracy, weigh the calibrated weights in different combinations to see if the results represent the correct sums of the weighed objects. These procedures measure the linearity of the scales. A taring test determines whether the linearity tests continue to produce the same results when the scale resets to zero or to a non-zero calibration. When conducting testing of high accuracy scales, use a room with a controlled temperature. For some equipment, the internal temperature of the equipment is also important. Additionally, weighing equipment can be sensitive to static electricity and radio frequency or electromagnetic interference. The term ÒdriftÓ describes inaccuracies caused by environmental factors like temperature and static electricity. For equipment used in conditions in which these variables are not controllable, then it will be necessary to measure the sensitivity drift of the scale. Manufacturers provide temperature ranges for their equipment along with calibration certification in some cases. Note that calibration certification not might be valid if the equipment comes from a distant location. For devices that require high accuracy, even differences in geomagnetism and barometric pressure can result in measurement differences when compared to the equipment calibration location. The frequency of calibration will depend on how important accuracy is to the operation and on the conditions that might cause the equipment to lose accuracy. Some organizations may recalibrate weighing systems on a monthly basis while others conduct testing at the start of each shift or even before each use of the equipment.